The Joplin Athletic Complex features five venues capable of hosting variety of athletic events. In addition to the venues, the Joplin Athletic Complex features playgrounds, covered gazebos for picnics and can host fun runs and 5K races. This varsity baseball stadium recently underwent a turf installation project as the infield now sports SprintTurf playing surface. The dimensions of the ballpark are the same as the original Busch Stadium in St. Louis and the stadium is named for longtime legendary Joplin Globe sports editor Wendell Redden, a member of the Joplin Area Sports Hall of Fame. The outfield grass is Bermuda with rye overseed, spectator seating is covered, ADA accessible, with air conditioned press box (with space for scorekeeper, scoreboard operator, PA operator and one radio broadcaster), sound system, scoreboard, lights, enclosed dugouts, turfed bullpens and two batting tunnels located down the right field line. It served by its own concession stand and restroom building located at the front gate. The stadium has played host to the 2010, 2012 and 2014 NJCAA Region 16 Baseball Championships, the 2014 and 2015 NAIA Heart of America Athletic Conference Baseball Championships, Premier Baseball Junior Championship, the Missouri Christian School Athletic Association State Baseball Championships and 2017 Missouri Babe Ruth 15-under State Baseball Championship. The Hershewe Soccer Complex at the Joplin Athletic Complex features two full-sized fields and two smaller sized fields ideal for youth soccer, 8-v-8, 7-v-7 or 3-v-3. All four fields are natural grass and have electronic scoreboards and lights and is served by a concession stand and restroom building located in the center of all four fields. Field No. 2 is the championship field featuring an elevated press box, covered team benches and covered seating for spectators. Fields can be arranged to host a multitude of events including 11-v-11, 8-v-8, 7-v-7 and 3-v-3 soccer, 7-on-7 football passing tournaments, lacrosse, quidditch and archery. Hershewe Soccer Complex has hosted Association of Christian College Athletics (ACCA) National Soccer Championships, Missouri Christian School Athletic Association State Championships and 3-v-3 Live Regional Tournaments. 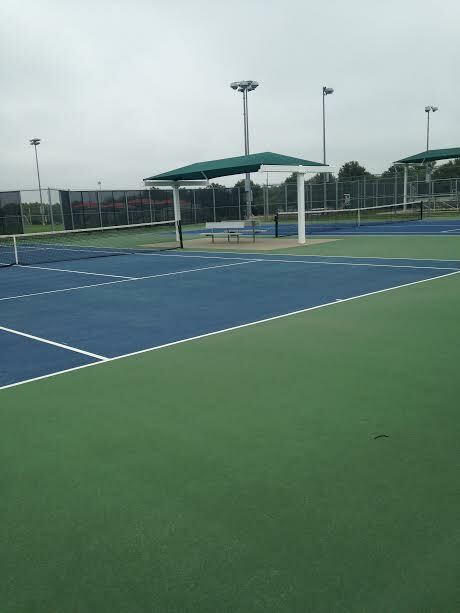 The Joplin Athletic Complex tennis courts feature 10 courts, all with their own lights, covered benches for participants and one half-court warm-up area. Court No. 1 is the featured court with covered spectator seating, all other courts feature benches for spectators and a large covered gazebo in the center of the venue to serve as tournament headquarters. Concession stand and restrooms are located next to the courts in the Joplin Parks and Recreation Administration Building. Perimeter fences are covered with windscreens, singles sticks and scorecards are available. The courts hosted the 2014 NAIA Independent Grouping Tennis Championships and the 2014 NAIA ITA Regional Championships. Numerous high school conference, district and regional tournaments have been held on the courts. Opened in 2012, the four-plex of fields at the Bassman Softball Complex can host a multitude of baseball and softball games. All four fields feature crushed red stone infields properly built on base of sand and silt that drains extremely well following rain. Outfield is Bermuda grass with permanent 300-foot fences and the ability to place temporary fences at various depths. The fields were built on a one-degree slope to aid in the drainage process. All four fields have covered dugouts and covered spectator seating, a change room for umpires, covered play area for children and is served by its own concession stand and restroom building located in the center of the four-plex. The fields are capable of hosting youth baseball games for ages 14-under through 8-under thanks to adjustable bases and pitching mounds and capable of hosting girls fast pitch games from college through 8-under and adult slow pitch games. The Bassman Sports Complex has been the host of the Missouri Southern Teri Mathis-Zenner Softball Classic each March, the Crowder Bash Junior College Softball Tournament each March, USSSA weekend points tournaments for baseball and softball March through June, the USSSA 13-under AA State Baseball Championship, USSSA 13-under AAA State Baseball Championship, USSSA 8-under Coach Pitch State Baseball Championship, USSSA 18-under Class B Fast Pitch World Series in July and the Cal Ripken Central Plains 8-under Machine Pitch Regional Championship. Other events include Joplin Association for the Blind Beeper Ball Classic and Joplin Fall Baseball League. The venue is named for Gene Bassman, a member of the Joplin Area Sports Hall of Fame and known as Mr. Softball in Joplin. The Will Norton Miracle Field is located next to Wendell Redden Stadium is home to Joplin’s Miracle League. The Miracle League provides opportunities for individuals with disabilities to play Miracle League baseball, regardless of their abilities. The venue features an all-purpose playing surface, covered dugouts and covered spectator seating. The Will Norton Miracle Field is home to the first handicap-accessible playground in Joplin. The field was named for Will Norton, a Joplin High School student and victim of the May 22, 2011 tornado.